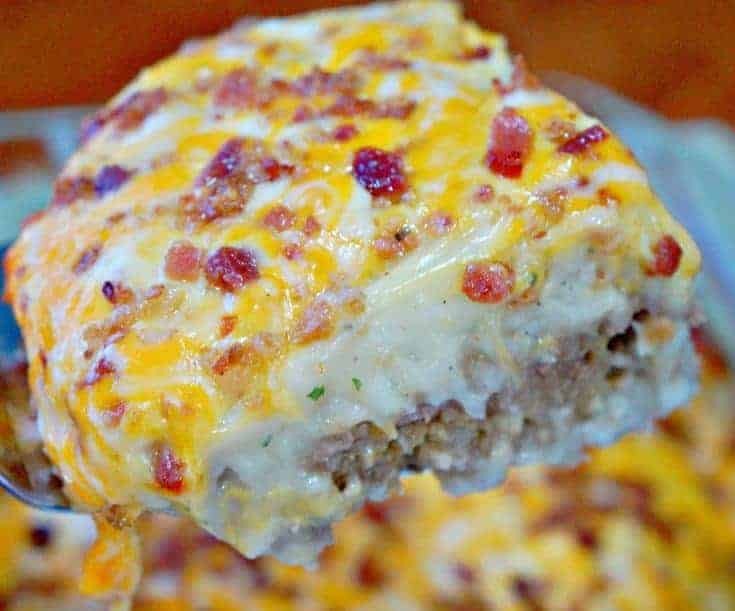 This Loaded Potato Meatloaf Casserole topped with mashed potatoes, cheese and bacon is a perfect easy dinner recipe. 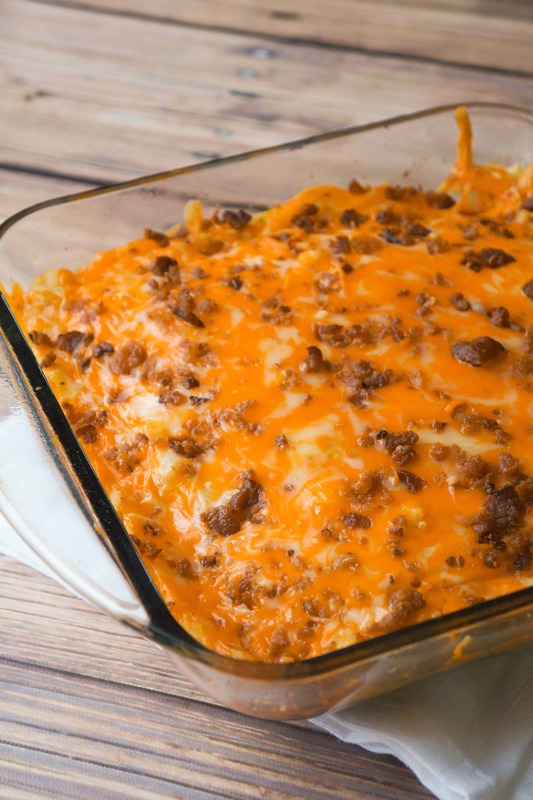 It is one of the best casserole recipes I’ve tried and is so easy to make. 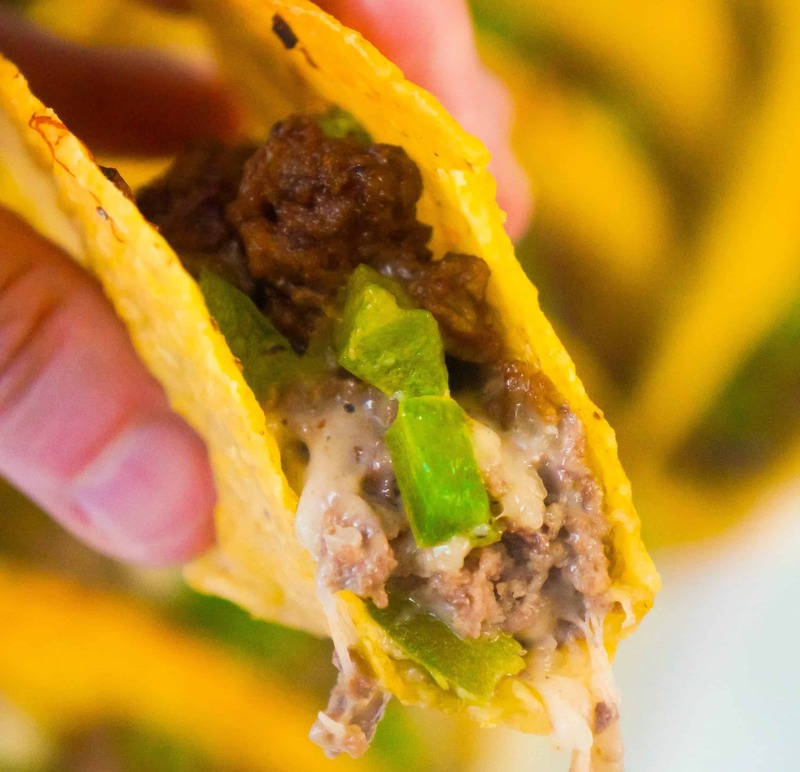 This easy ground beef recipe serves four and takes less than an hour from start to finish. Pull out this recipe when you need a delicious dinner in a hurry! If you make a lot of casseroles I highly recommend you invest in some baking dishes with lids . 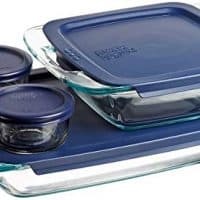 They make storing leftovers so much easier and are great for transporting food. No more fighting with cling wrap! 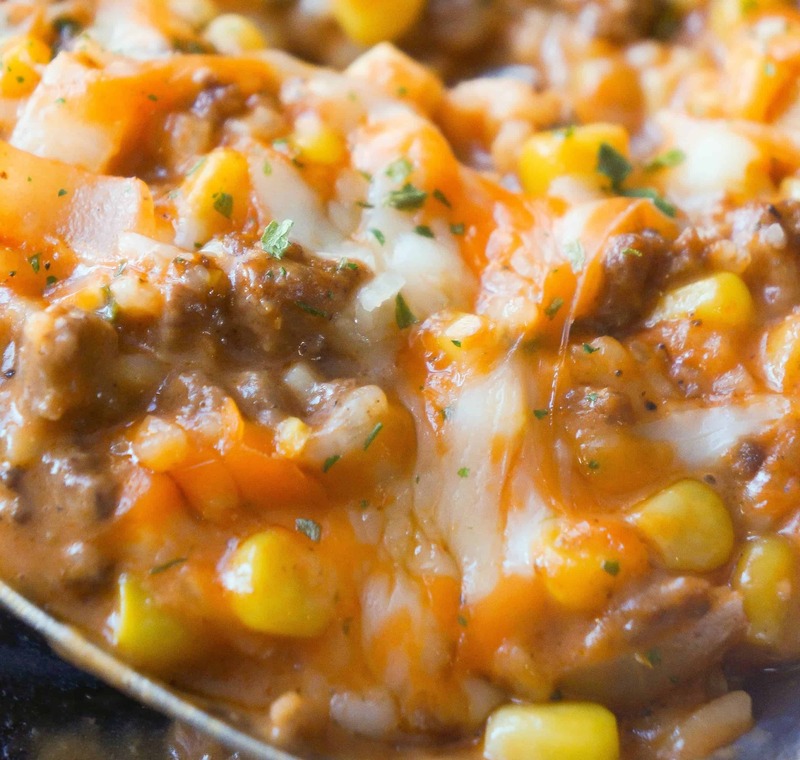 I tend to make a lot of chicken casseroles but I came up with this recipe because I had a freezer full of ground beef (I always stock up when it’s on sale!) and wanted to try something different. I’ve always loved meatloaf and nothing goes better with tasty ground beef than mashed potatoes. And once you add mashed potatoes you might as well go all out and add some cheese and bacon too! 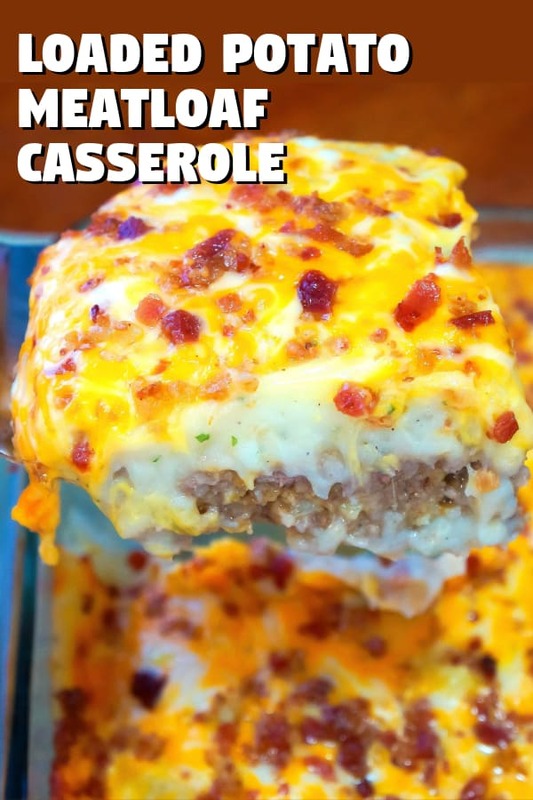 This ground beef casserole recipe combines delicious meatloaf and garlicky mashed potatoes loaded with cheese and bacon. I started by mixing ground beef and diced onions with seasoned Italian bread crumbs, brown sugar and Worcestershire sauce for flavour. You could definitely add in some of your personal favourite seasonings too. I added one egg to the mixture to hold everything together. I used my hands to get the mixture fully combined. The meat mixture was then pressed into an 8 inch square baking dish. I topped the meat with garlic instant mashed potatoes. 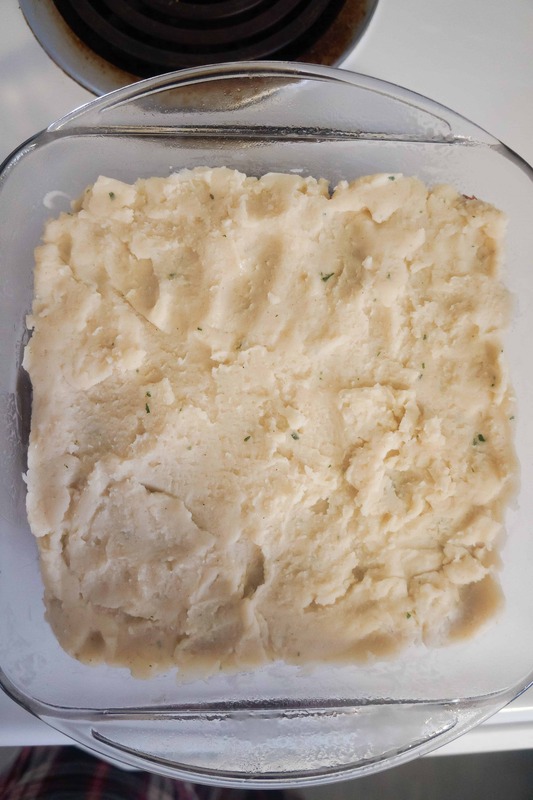 I used instant mashed potatoes to save on time but you could make them from scratch if you prefer. You could also try a different flavour of the instant mashed potatoes. 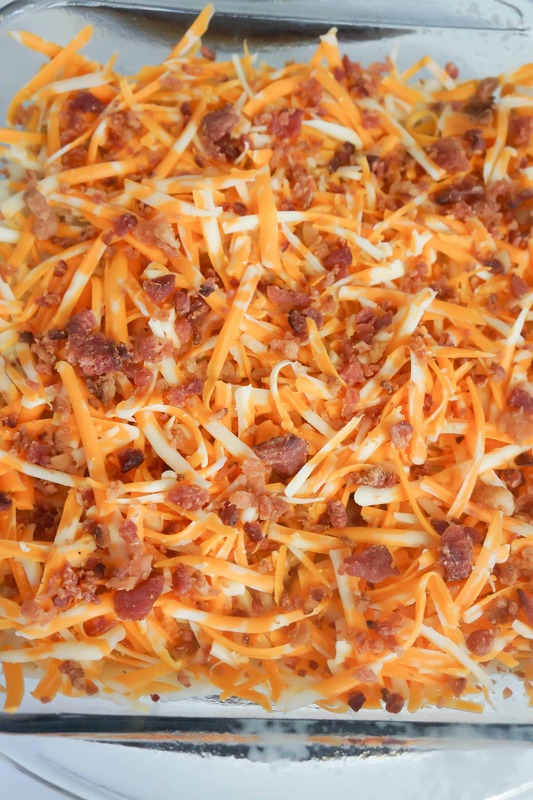 Grated marble cheese and real bacon bits sprinkled on top take this dish to another level. I used store bought bacon bits as another time saving measure. 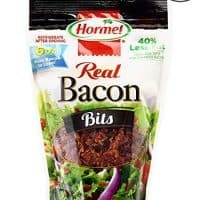 Walmart sells a large bag of real bacon bits for a really great price. I try to always have some in the fridge because they come in really handy. If you’re not short on time you could cook your own bacon. The potato meatloaf casserole cooks up in just 40 minutes at 400F. I kept it covered with aluminium foil until the final ten minutes of cooking to prevent the cheese from burning. Nothing beats this juicy meatloaf topped with velvety smooth mashed potatoes and oozing with melted cheese! I am so in love with this dish. It is such a fun twist on the traditional meat and potatoes dinner. 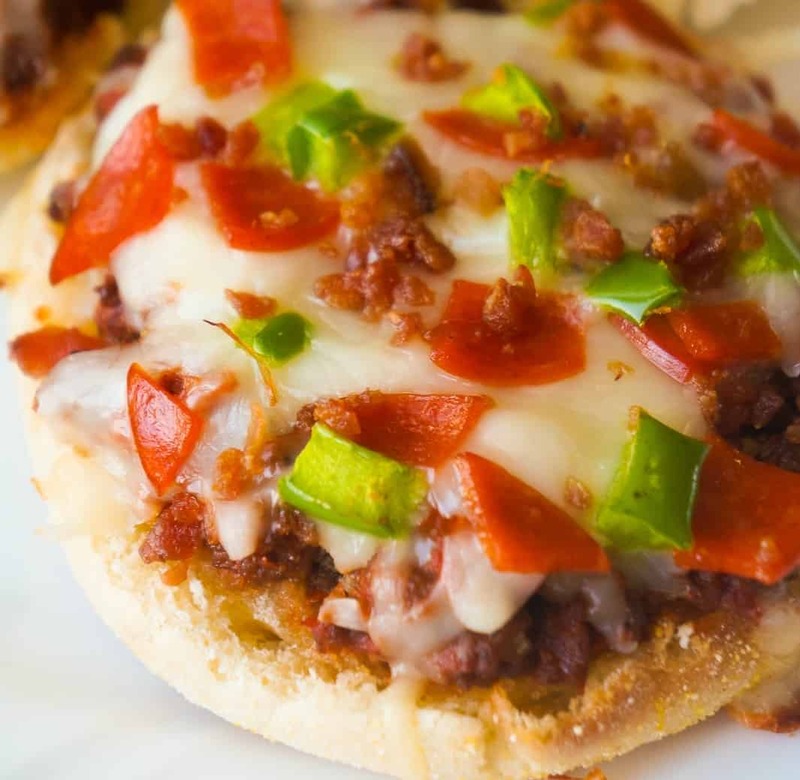 This super easy ground beef dinner recipe serves four and I guarantee your family will be asking you to make it again and again! 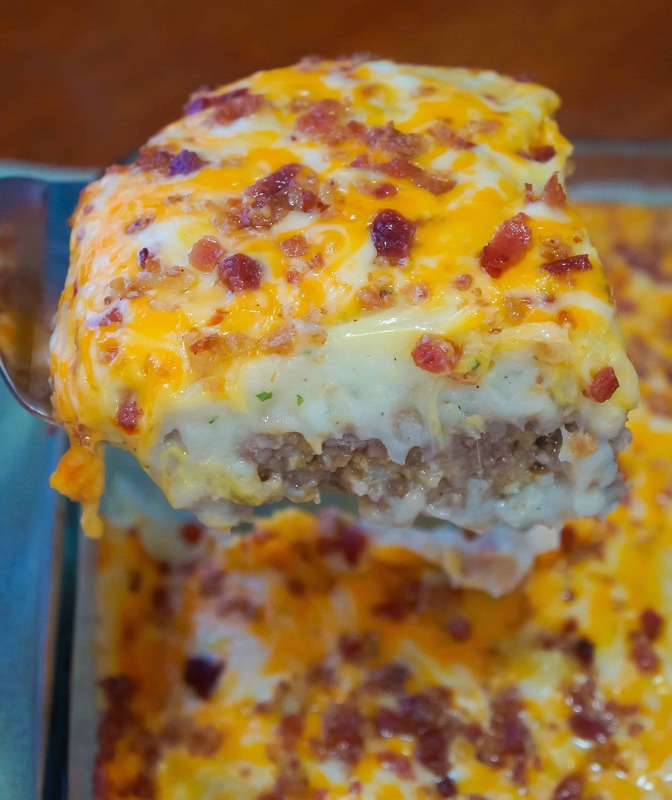 Pull out this potato meatloaf casserole recipe next time you’re in need of an easy weeknight dinner. 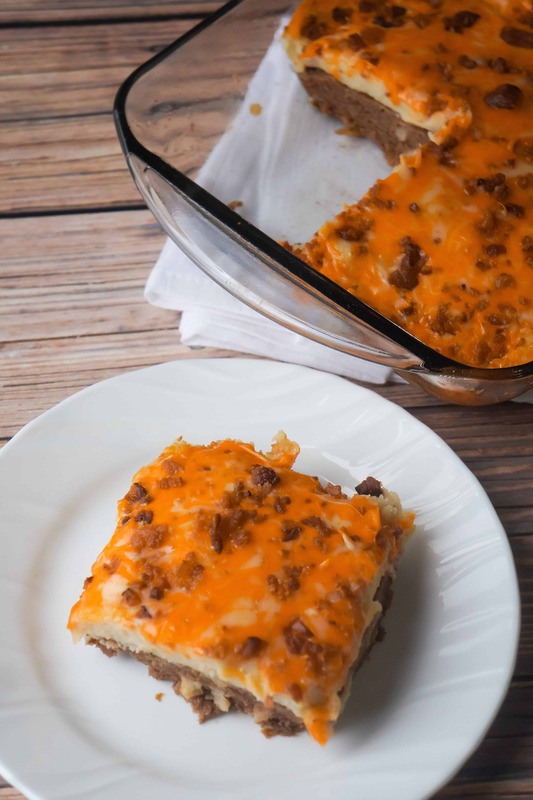 If you are looking for more easy casserole recipes check out Cheeseburger Casserole, Easy Ground Chicken Casserole and Chicken and Green Bean Casserole. Another easy ground beef dinner recipe. 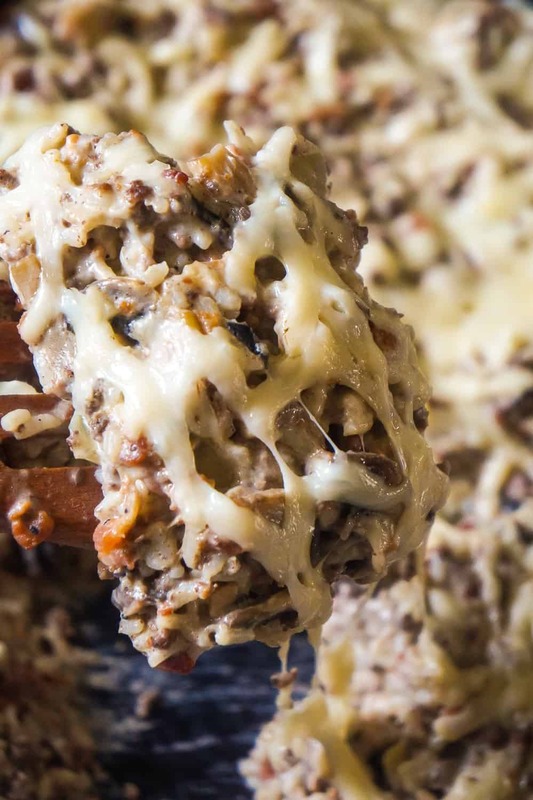 Check out this Bacon Mushroom Swiss Ground Beef and Rice! 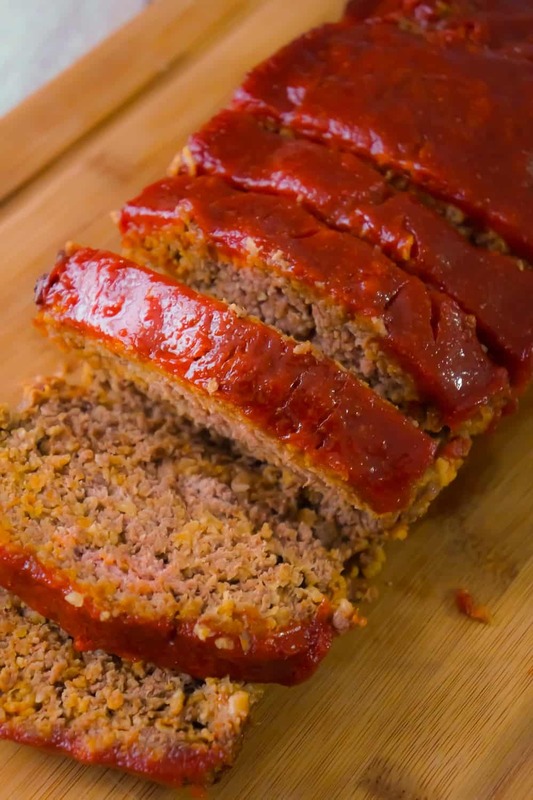 Another delicious meatloaf recipe. 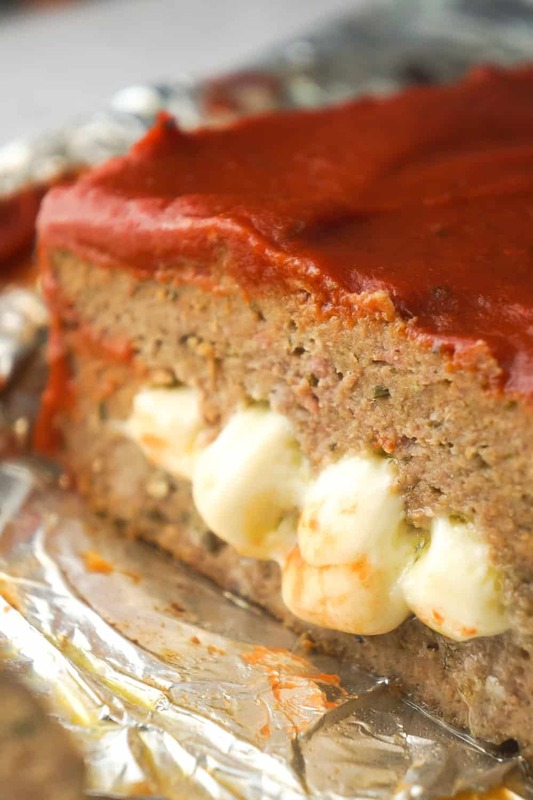 Check out this Cheese Stuffed Chicken Meatloaf! 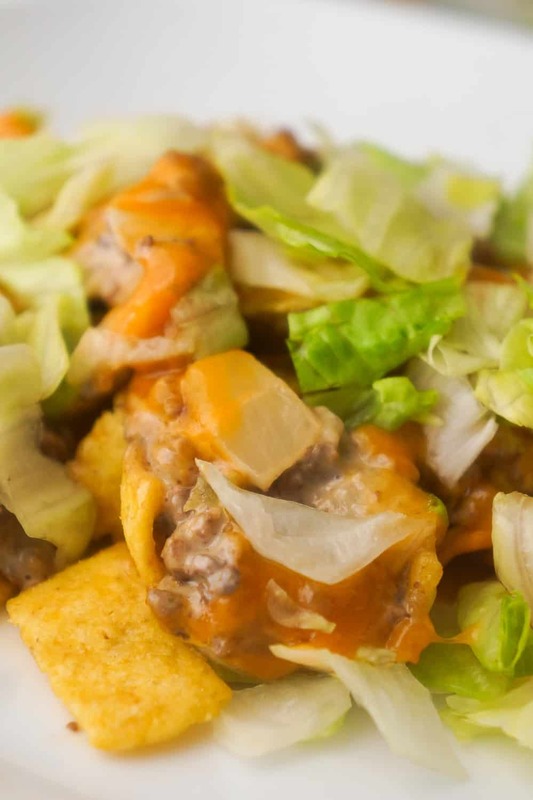 Be sure to also check out Big Mac Frito Pie! Another delicious loaded potato recipe. 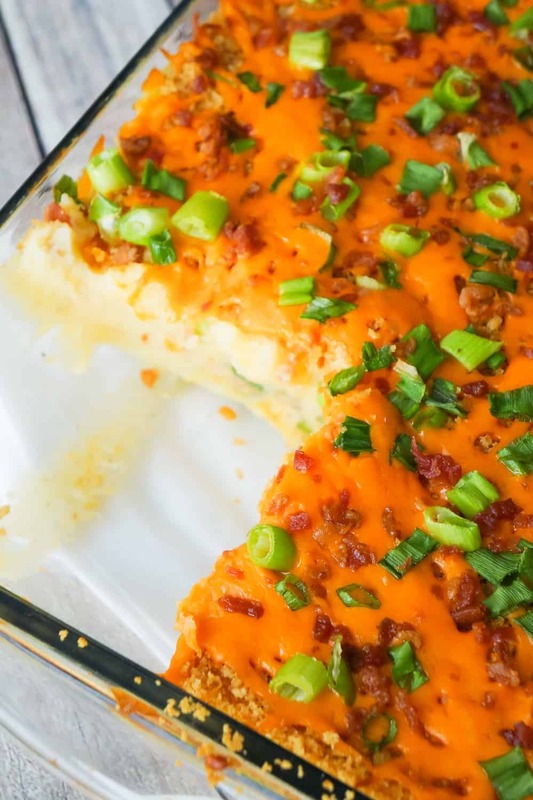 If you are looking for a side dish instead of a full meal, check out this Loaded Mashed Potato Casserole! 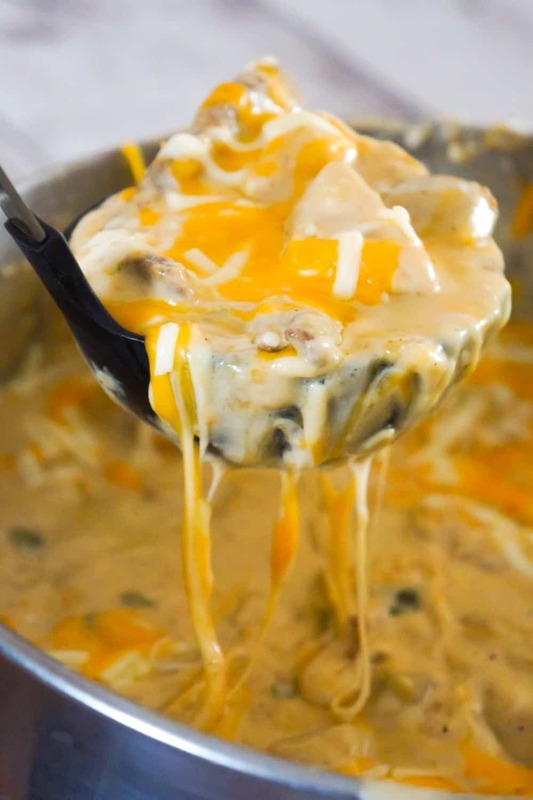 Philly Cheese Steak and Dumplings is a cheesy and delicious easy dinner recipe! 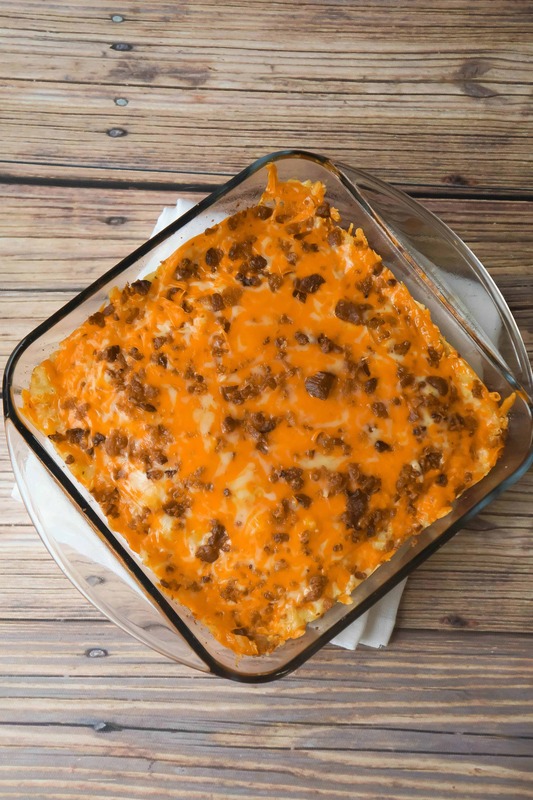 Easy casserole recipe with ground beef and loaded mashed potatoes. In a medium saucepan bring water and milk to a boil. Remove from heat and stir in instant mashed potato powder. Set aside. 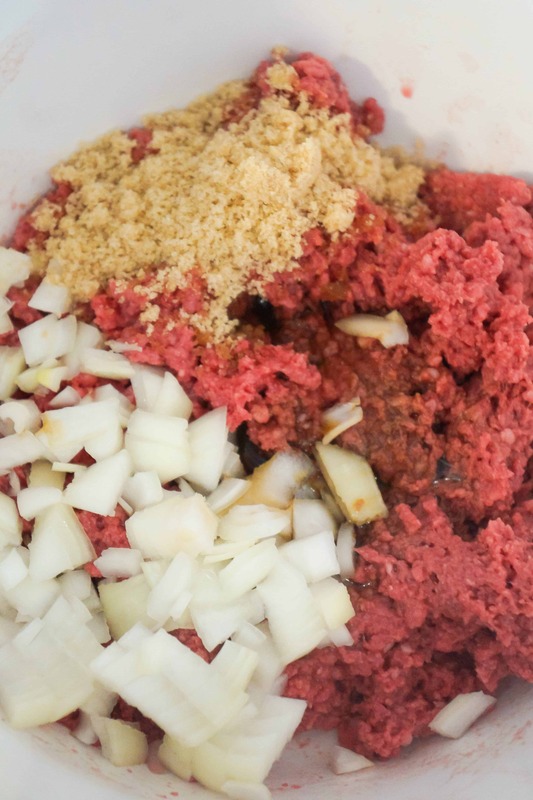 In large mixing bowl combine ground beef, onions, brown sugar and Worcestershire sauce using your hands. 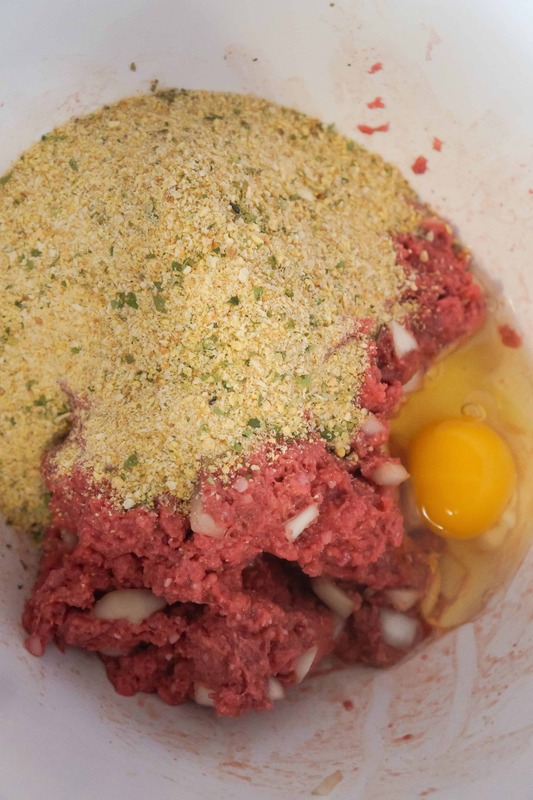 Add bread crumbs and egg to the meat mixture and continue mixing it with your hands. 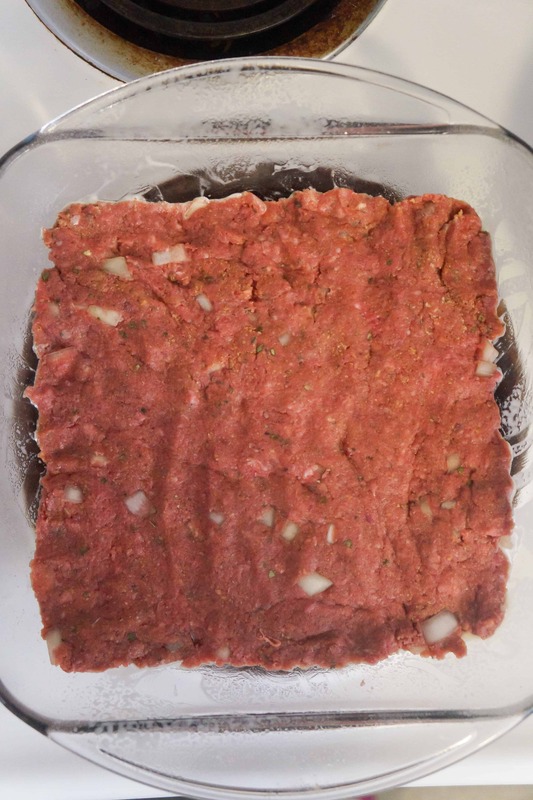 Press the meat mixture evenly into an 8 inch square baking dish. Spread the mashed potatoes over the meat using a rubber spatula. Sprinkle the grated cheese on top followed by the bacon bits. Cover the dish with aluminum foil and place in oven for 30 minutes. Remove foil and continue cooking for another 10 minutes. Remove from oven and allow to cool for a few minutes before slicing and serving. FREE recipes to your inbox! Subscribe now! Did it come out greasy from the beef cooking on the bottom? Wondering the same, is it greasy from uncooked meat? Yes, I would suggest cooking the hamburger first so the hamburger can be drained properly. Then add the potato top with cheese. I will be trying this one out tonight. I’m going to try baking the meatloaf mixture in the microwave for about 20 minutes, drain the fat off , then add the potato mixture and continue baking. 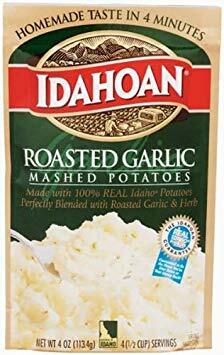 If I want to use real mashed potatoes (do it myself) How many cups or potatoes would I need? You would need about 2 cups of mashed potatoes. It’s not greasy at all!! This is one of my boyfriend’s favorite dinners. It’s in our regular rotation. I added ketchup and seasoning (garlic pepper) and it is delicious. Supper easy to make. I also use four cheese potatoes, it’s all in your preference. I made this with left over meatloaf I had cut in slices and froze for sandwiches. When I read this recipe I had to try it. I also put ketchup on my slices and used an 8 x 8 glass dish. I used instant mashed potatoes, cheese and store bought bacon crumbles. It was fantastic, I will do this again on purpose because it was so good and quick. I heated the oven to 3:50 and baked fo 30 minutes with foil on top. This came out amazing, I used half ground turkey and ground chicken. It was delicious. My family loved it! I made this tonight. It was definitely NOT greasy. It was very good, but I think next time I won’t put it in sans foil. It was delicious, but the meat was slightly more cooked than I normally like. The boyfriend loved it though, so it’s all a matter of preference, I guess. That said, it was super easy to make and very good. I’ll definitely do it again. One of the best casseroles I’ve ever eaten my wife and son also flipped out over this. Definitely telling people about this casserole. Finished making this recipe less than 15 minutes ago. It came out great. Could use a bit more seasoning to cut the sweetness of the brown sugar, but other than that it was a good dinner. Just made a Loaded Potato-Meatloaf Casserole for dinner tonight.. It was yummy i have 2 other people that says its a keeper. I’ve made this 2 times already & I learned that if you brown the meat 1st, it won’t be as greasy!!! Love it!!! I am truly horrible at cooking and am dying for new recipes! A friend at group told me to check Pinterest and I’m glad I did because this looks like something my family will truly enjoy! I just hope I read these comments and remember them! I modified this dish by using 1/3 pork sausage and very lean ground beef. No greasiness at all. My family very much enjoyed it but, next time I make it I’ll add a bit more garlic and perhaps some diced jalapeno peppers. If I wanted to use a 13 x 9 inch pan, should I double the recipe and cook twice as long? How did you reheat this?? I’ve made this recipe multiple times and never had an issue with grease, however I use at least 93% lean ground beef. Muy family loves this recipe. I usually have to double it so we have leftovers. It was awesommeee thank you. Im going to add garlic and 86 brown sugar next time no sweet meat. I made the meatloaf first (with more spice and ketchup and tomato paste on top) then put slices of it in the bottom of the pan, instead of raw meat. Also added sliced green onions on top. It was amazing! Everyone loved it at the potluck I brought it to!!!! Ok I am cooking this tonight, But I was going to use leftover meatloaf and mash potatoes..
Any recommendation for cook time with more ground beef. I have a larger family to feed and would like to use 2.5 pounds of ground beef! I made this last night but I tweaked it to my families liking. I made my version of meatloaf bc I didn’t want brown sugar in it. I also made fresh mashed potatoes the way we like it. I also omitted the bacon bc we dont like them in our potatoes but added sliced green onion on top instead. My casserole was greasy on the bottom but I knew it would be bc I used 80/20 beef. Not a problem though, I just drained it off and there was no greasy taste or mouth feel. I guess you can say I used this recipe in idea only. So thanks for the great idea. They always say to take a recipe and make it your own. Just made this tonight! It was good! My husband and son like it a lot!! Thanks for a new recipe!! Yum!! I love this and so does my husband. I follow the recipe to the exact and we love it!!!! Thank you for sharing this! Did you substitute anything for the brown sugar? I did what it said!!! Everyone LOVED IT!!!???????????? Delicious! Followed the recipe and we enjoyed it very much! Best part about this recipe is it and be tweaked to your specific tastes. 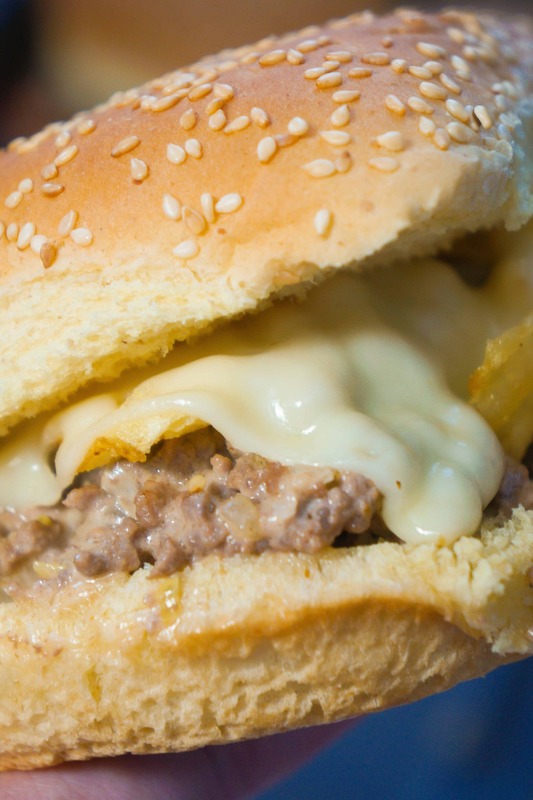 Use the highest grade ground beef and you won’t have any grease to worry about. Easily assembled and plated beautifully! Will make again!!! Delicious dish. I sautéed my onions before adding them to the meat mixture. Family enjoyed it. It was a little greasy, but I tilted my pan to drain the grease after cutting the first piece out. Yum!! I made mine with ground turkey and doubled everything. I didn’t have an onion but will next time. I’m not sure where the brown sugar comes in but it was tasty. Next time I will use less brown sugar and bread crumbs. More whistershire and maybe some sour cream to top it off. I used real bacon also. For just about $15 it has fed a family of 3 men and myself dinner and lunch. Plus my son’s band mates got to sample it. Well worth it!!!! If I double it could it be cooked in a 9×13 pan? And how long would I cook it for ? I made this tonight in a 9 x 13 Pyrex dish. I cooked for 50 minutes total. The onions could have been cooked a bit longer. Maybe 55 or 60 minutes would be better. I did not have bacon bits but I crumpled up some bacon flavored fried onion pieces that were meant for salad topping. It was very good. I doubled everything to fit the larger dish. Next time I will cut back on the sugar and maybe add more spices. Followed the recipe to T. And my family Loved it!! And my husband isn’t a great fan of meatloaf. The brown sugar gave it such a different twist than regular meatloaf. Tonight I’m trying it with Idaho Spuds VeggieMash – broccoli and cheese flavor.. Can’t wait!! I made this last night, and it was delicious! 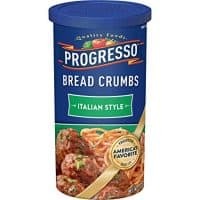 I didn’t have the bread crumbs so I crushed up some croutons instead. I used garlic mashed potatoes from Schwan’s. No grease issues here! Will definitely be making this again! Thanks for the recipe!